We bring forth the finest quality Granular Sulphur Black Dye for our esteemed clients. Sulphur dyes are dyed from a dye bath containing Sodium Sulphide and common or Glaubers Salt, and are oxidized by airing or with some oxidizing agents (Sodium Bichromate or Hydrogen Peroxide) in a fresh bath. 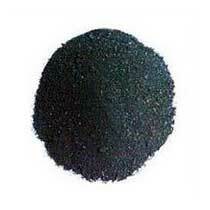 These Granular Sulphur Black Dyes find their use in a number of industries.